U.S. Secretary of State Mike Pompeo meets with the Saudi Crown Prince Mohammed bin Salman during his visits in Riyadh, Saudi Arabia, Oct. 16, 2018. 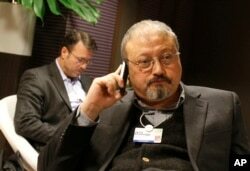 The search for what happened to missing Saudi journalist Jamal Khashoggi progressed on several fronts Tuesday, with Turkish crime scene investigators finishing an inspection of the Saudi consulate in Istanbul and U.S. Secretary of State Mike Pompeo meeting with Saudi leaders in Riyadh. The U.S.-based cable television network CNN and the New York Times also reported Saudi Arabia was preparing to admit Khashoggi was killed after he entered the consulate on October 2. The reports, citing unnamed sources, said the Saudi government would blame Khashoggi's death on an interrogation gone wrong. Up until this point, Saudi officials have strongly denied accusations by Turkish officials that Khashoggi was killed, saying instead he left the diplomatic outpost on his own. Neither side has publicly shown clear evidence to back up its claim, and the two governments agreed on a joint working group to probe Khashoggi's disappearance. After talks with Saudi Arabia's King Salman on Tuesday, the State Department said Pompeo "thanked the King for his commitment to supporting a thorough, transparent, and timely investigation of Jamal Khashoggi’s disappearance." Pompeo also met with Saudi Foreign Minister Adel al-Jubeir and Crown Prince Mohammed bin Salman. U.S. President Donald Trump said he was dispatching Pompeo to U.S. ally Saudi Arabia "to find out really, firsthand, what happened." "He may go to Turkey, he may not. He may meet with all of them together," Trump said. "But we want to find out what happened. And he's got instructions to find out what happened." Trump said King Salman in a telephone call Monday denied having any knowledge of what happened to Khashoggi, who in his writing for the Washington Post was a critic of the heir to the Saudi throne, Crown Prince Mohammed bin Salman. "His denials to me could not have been stronger," Trump said at the White House. "Maybe I do not want to get into his mind, but it sounded to me like maybe these could have been rogue killers - I mean, who knows?" Khashoggi was living in self-imposed exile in the United States. He went to the Saudi consulate in Istanbul to get documents he needed to marry his fiancée, Hatice Cengiz, a Turkish national who waited in vain outside for Khashoggi to return. Trump told the CBS news show "60 Minutes" on Sunday that Saudi Arabia would face "severe punishment" if it is determined Khashoggi was killed inside the Saudi consulate, but Riyadh dismissed the U.S. threat and said it would retaliate if Trump took any action against Saudi Arabia.